GCU colleagues from CBS, the School of Engineering and Computing and the Department of Research, Innovation and Enterprise attended the KTP Scotland Awards at the Doubletree Dunblane Hydro last week. The University was nominated for two Knowledge Transfer Partnership (KTP) Scotland Awards. Professor Bruce Wood’s work with Rawlplug Ltd, one of the leading manufacturers of specialist anchoring and fixing systems used in construction, industry and retail markets, was formally rated as outstanding by independent assessors as part of the KTP programme. In CBS, the first KTP in Scotland on human resource management, led by Dr Gill Maxwell and Morag McLean of the Department of Management, was also nominated for a KTP Scotland Award. The KTP with Integrated Environmental Solutions Ltd (IES) was formally rated as very good. For more information on either project or working with GCU on a KTP project, please contact Knowledge Transfer Manager Janette McAlpine on j.mcalpine@gcu.ac.uk or call the Applied Knowledge Exchange on 0141 331 3189. The Government is supporting Street League as part of its plans to help build a stronger culture of giving time and money to support charities and voluntary organisations. Staff within the Prime Minister’s Office voted for the charities and social enterprises they would like to support in 2011. They selected Street League, an organisation that delivers sports and educational programmes to tackle issues including homelessness, substance addiction, crime and unemployment. The charity is currently working with Glasgow Caledonian University on a Knowledge Transfer Partnership (KTP). The work is being led by the School of Engineering and Computing and aims to design, develop and implement a range of internal and external communication applications for diverse audiences by integrating user centred design with new technologies. The Government is investing £200m in a network of elite Technology and Innovation Centres overseen by the Technology Strategy Board. These centres – likely to focus on key areas such as renewable energy – will complement and link with other work which the Technology Strategy Board already manages to promote collaboration between universities and business, driving innovation and the commercialisation of new technology and ideas. Examples include the Knowledge Transfer Networks, national networks where business and researchers can share ideas and opportunities, and Knowledge Transfer Partnerships which place graduates in business to work on innovative projects. Each centre will focus on a specific technology where there is a potentially large global market and a significant UK capability. The centres will allow businesses to access equipment and expertise that would otherwise be out of reach as well as conducting their own in-house R&D. They will also help businesses access new funding streams and point them towards the potential of emerging technologies. Working with industry and government, the Technology Strategy Board will develop a strategy and implementation plan for the elite network of centres by April 2011. Joe Docherty of Glasgow Caledonian University explains on the Glasgow Chamber of Commerce site how your organisation can benefit from KTPs. KTPs are a UK-wide programme funded by the Technology Strategy Board along with the Scottish Government. KTPs aim to help businesses improve competitiveness, productivity, and performance. This is done by forming a partnership with a university, college, or other provider of knowledge and expertise. The KTP then allows you to access the skills and expertise of the university or other partner institution in ways that will benefit your business. Find out more about KTPs from the Applied Knowledge Exchange at GCU. GLASGOW Caledonian University has been nominated for two Knowledge Transfer Partnership (KTP) Scotland Awards. Knowledge Transfer Partnerships is a UK-wide programme enabling businesses to improve their competitiveness, productivity and performance. Glasgow Caledonian University’s work with Rawlplug Ltd, one of the leading manufacturers of specialist anchoring and fixing systems used in construction, industry and retail markets, has been formally rated as outstanding by independent assessors as part of the KTP programme. Lead academic on the project was Dr Bruce Wood of the School of Engineering and Computing, who oversaw a KTP project working with Mary Maclachlan involving finite element analysis and optimisation in fixture design. This KTP project was the third with Rawlplug, which previously worked with Glasgow Caledonian University to establish a new system for product design and development and implement a new CAD system. In Caledonian Business School, the first KTP in Scotland on human resource management, led by Dr Gill Maxwell and Morag McLean of the Department of Management, has also been nominated for a KTP Scotland Award. The KTP with Integrated Environmental Solutions Ltd (IES) was formally rated as very good, the second highest category of rating, and was completed early this year. With GCU’s expert advice on HRM, IES now has an HR specialist in its Glasgow head office and a firm basis for developing HR strategy and practices to actively support rapid and on-going international expansion. The KTP Scotland Awards takes place in February at the Doubletree Dunblane Hydro in Perthshire. For more information on either project or working with Glasgow Caledonian University on a KTP project, please contact Knowledge Transfer Manager Janette McAlpine on 0141 331 8877. Some of Glasgow Caledonian University’s areas of expertise feature in a new Business Insider Special Report on Knowledge Exchange. We have highlighted the CIC Start Online project, our High Voltage Engineering team, some of our Knowledge Transfer Partnerships (KTPs) and our Work-Based Learning Academies. 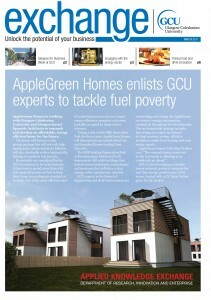 For the full supplement, please click here. AGRICO UK is working with Glasgow Caledonian University on a two-year Knowledge Transfer Partnership (KTP). Knowledge Transfer Partnerships is Europe’s leading programme, helping business to improve their competitiveness and productivity through the better use of knowledge, technology and skills that reside within the UK knowledge base. With the help of Glasgow Caledonian University’s food science experts in the Department of Biological and Biomedical Sciences, Agrico aims to introduce laboratory techniques to support the development of novel potato genotypes with specific nutritional properties.